For most users, VPN is synonymous to privacy, anonymity and bypassing local restrictions when accessing certain websites. Like the Great Firewall in China, or your kids’ school ban on social networks. 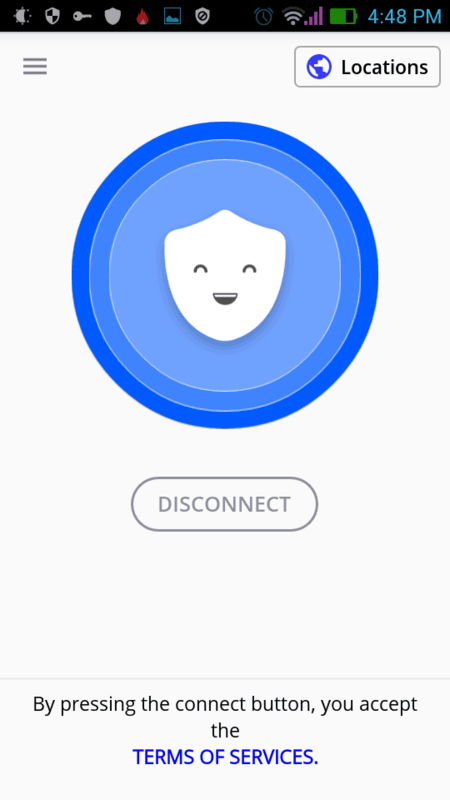 Free VPN Proxy by Betternet may solve your woes. We took a look at how it works, and here are a few considerations. First of all, Free VPN Proxy by Betternet is free. Nor does it require a registration. So, you don’t need to provide your email address to use the VPN service. 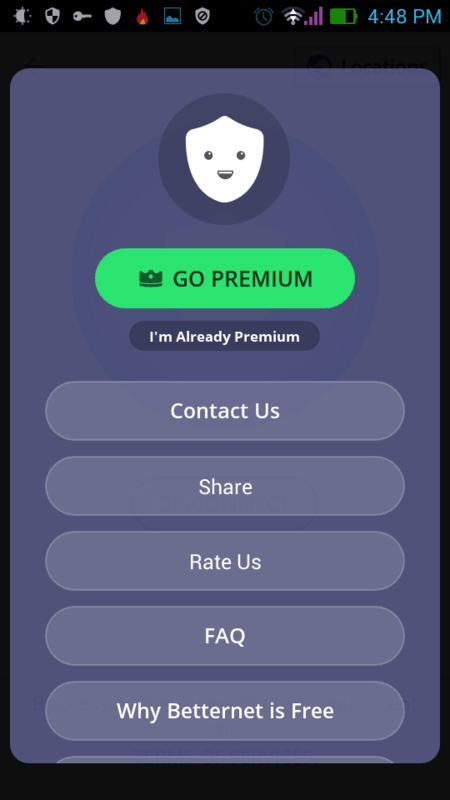 The app does come with a few IAP options, and paid subscriptions offer their users a way to change the IP to the one of the country of their liking. The free app, on the other hand, assigns you the most accessible server at the moment. 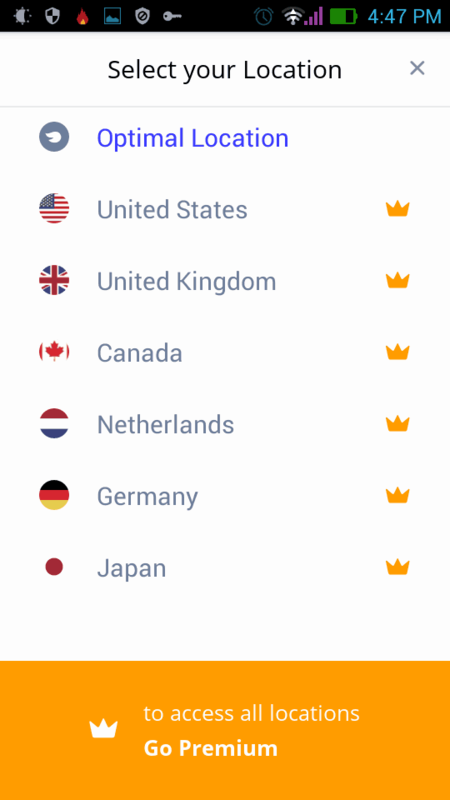 The list of countries available for paid subscribers includes USA, UK, Canada, France, Netherlands and Japan. There is no setup process as such, and the app itself comes with minimum options. 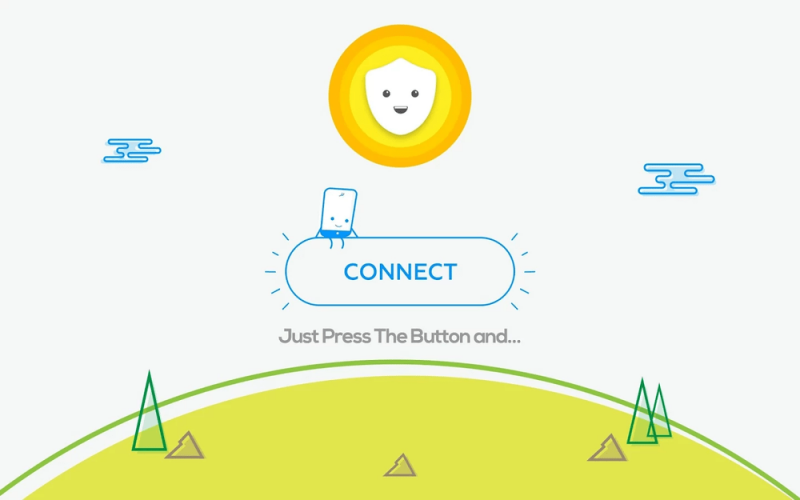 If you use the free version, all you have to do is just tap Connect, and start browsing. If you want to change your IP, you will need to quit or force-close the app first, and then Connect again. One peculiar thing that will matter for some Android users. 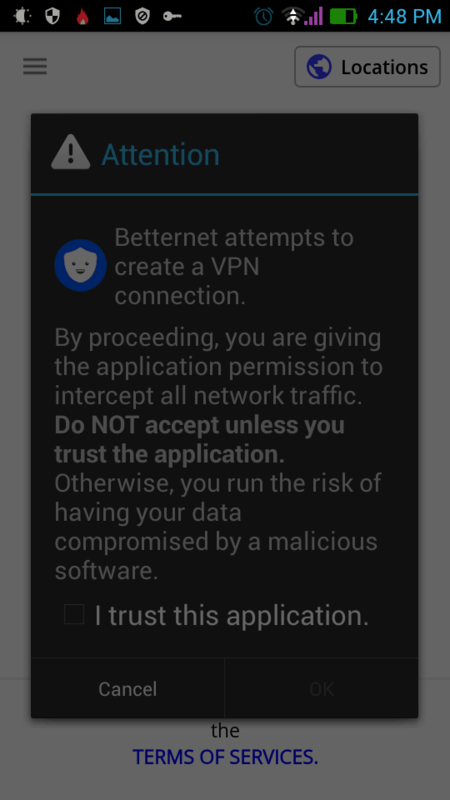 If you use a firewall app from the likes of NoRoot Firewall, Free VPN Proxy by Betternet will disable it. The two just can’t work together – it’s written in every firewall app’s description that it does not work with actual VPN. Hence, when you enable Free VPN Proxy by Betternet, your firewall app, that has been standing guard banning the apps and games from accessing the Internet, will be disabled. This means that even through you will be connected to the Internet via VPN, the private data leak might increase due to the disabled firewall. Free VPN Proxy by Betternet is a pleasant contrast to many other services in the way that it’s rather speedy. But I have been testing it with quite a speedy connection, so your mileage may vary. 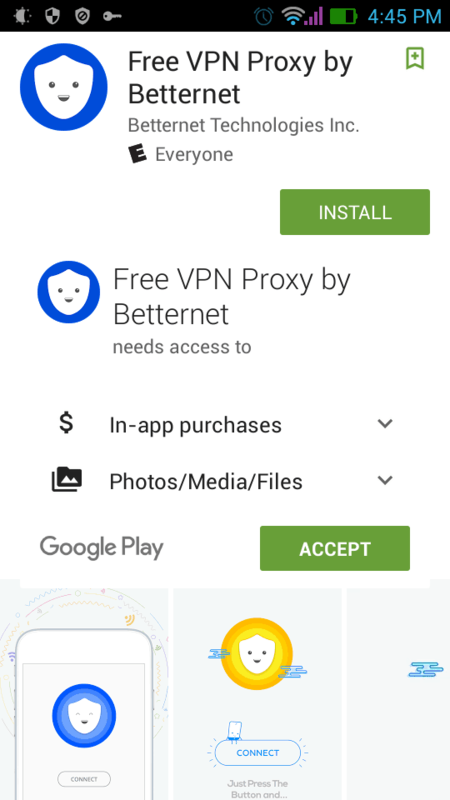 Free VPN Proxy by Betternet is free, so the developer monitizes the service through ads. On the one hand, they are quite unobtrusive, and come in two types. One is an offer to download a free app from the app store, and if you tap it you will see a list of apps on offer. Every time you install an app from that list, Betternet earns some funds, which you can see on their dedicated web page. The other is a full-screen pop up advertising, again, some of the promoted apps and games. This is a bit of a two-fold situation. 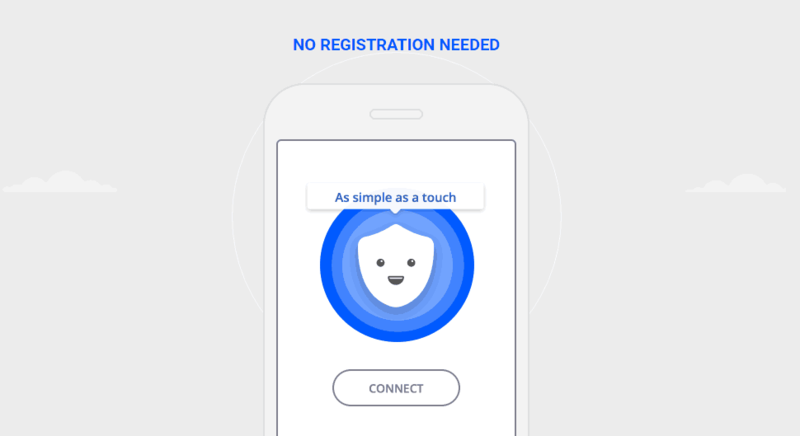 Free VPN Proxy by Betternet itself does not collect personally identifiable user data but for the time and duration of sessions, anonymously, according to the developer’s statement. This may not seem like a big deal for a high school student dying of boredom during classes, but for a privacy-conscious user this can be a deal breaker. Also, I have browsed the privacytools.io and greycoder.com/best-vpn-service/ to see if Betternet was anywhere on the lists of trusted VPN services among the reasonably privacy-paranoid communities. It’s not. It’s been discarded by default for being a US-based service, for better or worse. Privacytools.io specifically recommends to avoid VPN services based in the countries of the Five Eyes (USA, UK, Canada, Australia, New Zealand). Why – google PRISM, Snowden and mass surveillance. In other words, proceed at your own risk and with caution. This is not to say the above mentioned suggestion does not affect the honest US providers, but some entities behind the wheel of the US surveillance agencies have attributed greatly to the deterioration of user trust to their national service providers. Free VPN Proxy by Betternet lets you do torrents. It does not interfere unless the developer gets a DMCA notice or warrant. In this case, it will be able to disrupt the torrenting, but since the company does not collect personally identifiable information, it won’t be able to pinpoint a torrenting user to the authorities. Yet, considering the mentioned pros and cons, plus any legal repercussions of torrenting copyrighted content, we would not recommend it. 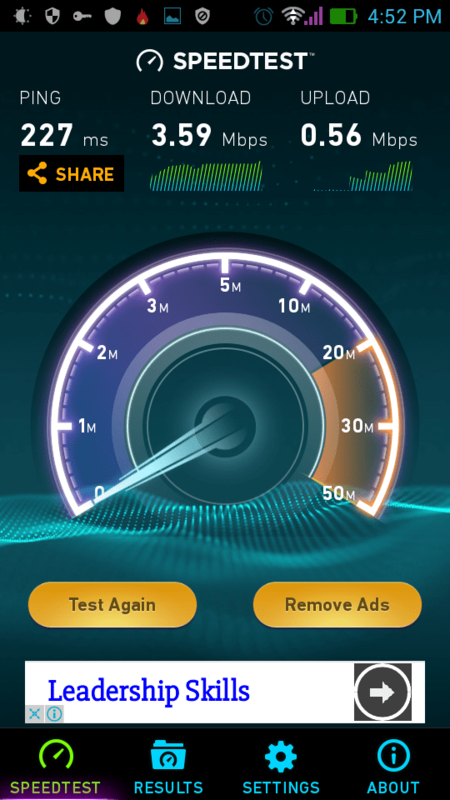 I have not had problems with Free VPN Proxy by Betternet other than a noticeable effect on my device’s battery. Some users, both iOS and Android, have reported disconnect issues as of late. This could be device or connection-specific, but you won’t know if it will affect you until you try. 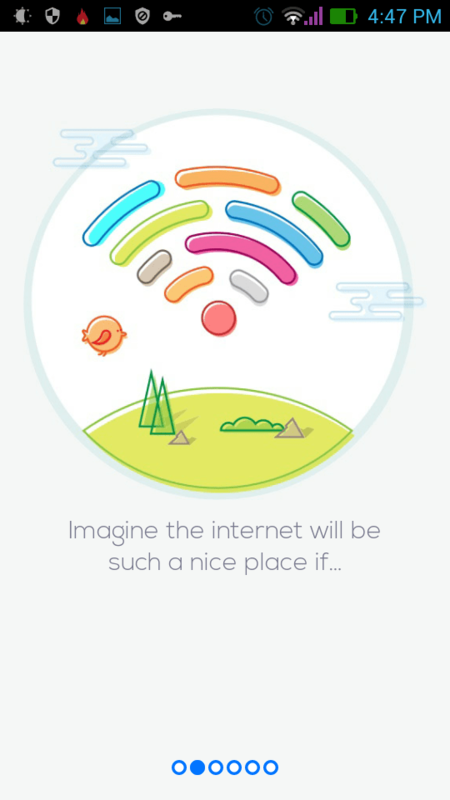 Free VPN Proxy by Betternet is a lucrative offer. It requires no registration, and offers a free, speedy connection to browse anonymously and freely, without restrictions. The free here also means you do not need to disclose your identity to a VPN service when you pay, nor do you need to mine Bitcoin to pay anonymously. Yet, the free product always comes at a cost. As you would expect, advertising third parties may collect some data, but you won’t know what they collect. Hence, the trade-off is obvious. If you need a VPN occasionally to access social networks from school, or China, go ahead. If you would like something more substantial in terms of options and privacy, check out the two links I posted in the Privacy section – there are extensive lists of VPN providers that overlap a lot. Free VPN Proxy by Betternet is a lucrative offer. It requires no registration, and offers a free, speedy connection to browse anonymously and freely, without restrictions. Yet, the free product comes at a cost. As you would expect, advertising third parties may collect some data, and that can be private.